As an organization, we are grateful to Mr Raju Malvi – our mentor and leader. Owing to his unmatched expertise in this domain, managerial skills and vast knowledge, we’ve been guided in the right path. Manufacturing and Trading of Hydraulic and Pneumatic Machines. 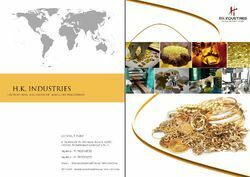 Our organization is engaged in manufacturing, supplying and exporting a comprehensive array of Jewellery Making Machine & Gold Coining Machinery Technically advance and suitable for Gold & Silver applications, our products are widely demanded in the market. High quality raw material and components are sourced from renowned vendors for fabricating these machines at par with the guidelines set by the industry. Customized on the basis of technical specifications, these machines are availed by clients depending on their requirement. Before the final delivery, the machines are checked for their construction, performance and power efficiency in order to deliver defect-free range. Goldsmith Wire & Sheet Rolling Machine. Wire & Sheet Rolling Machine. Single Roll Head Wire & Sheet Rolling Machine. Single Roll Head Wire Machine. Hydraulic Coin Cutting Power Press. Mr. HK Malvi has a extensive experience of over 48 years in the Jewellery Machine industry. He started HK in 1978 and under his sound leadership the company has grown from strength to strength. Since Many Years HK Has Transformed Itself From A Machine Manufacturer. To A Whole Solution Provider For Minting And Jewellery Making Solutions by providing full setup of machines. Presently, We Are India’s Leading Company in this field and Distributes High Quality Machinery for Gold Industries. More Over It Has Trade Over 8 Countries in Jewellery and Bullions Sector and Having Its Best Customer Satisfaction. It takes years to earn the trust of customers. We have been able to do so because of transparency in our dealings, besides other factors that play an integral part in our success. While constantly trying to upgrade our infrastructure and machinery, our top priority is client relations and being able to meet their demands by offering the best product in the market. We have our sister concerns company HK Industries who is leader in the market for making Gold & Silver Coining Machinery at large scale production line factory and presently it has catered to worlds leading Gold Bar & Coin Manufacturer / Minting Industries and successfully setup in more than 9 countries including. Indonesia, Bangkok, Malaysia, Myanmar, Nepal, Srilanka, UAE, Singapore and Europe. The Company has got the Approval from CE Europe Safety Standards for export in Europe Countries. HK provides completes ranges of machinery including full training and installation support. Our Machinery are Caters to Gold Jewellery Manufacturing Units, Small Goldsmith Shop & Gold Minting Industries. The Company has over 14 products to cater according to the clients requirements and the production needs. At present the company has two production line factory to manufactured these machinery. The Plant is located in Ahmedabad, Gujarat INDIA. The Company is also part of Dun & Bradstreet for Global Database Record.